A big-time winter storm arrived in Utah just in time for the MLK holiday. Unfortunately, high snowfall rates resulted in avalanches and treacherous travel up the Cottonwood canyons, ruining some peoples holiday plans and stranding others. 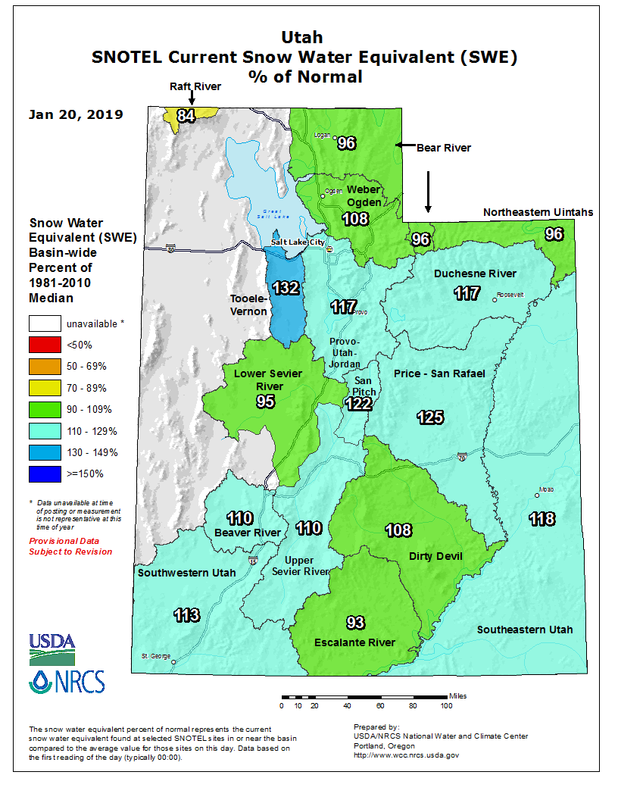 The good news is, cold conditions this week will allow for the snowpack and resort conditions to remain in good shape through the rest of the week. Since the beginning of today’s storm, the Alta Collins snow stake has reported 20 inches (!!!) of snow since 5 am. If you were one of the few lucky ones who able to ski today, you probably had some all-time country club skiing that we are all jealous of! According to the NRCS, these recent storms have pushed snowpack values to near or above normal for the water year. This is a nice change when compared to the below-average year Utah had last year. For the remainder of the week, a few weak shortwave troughs will pass through the region. This will likely only bring a few inches of new mountain snow, at the most. By the weekend, these small disturbances will give way to a high pressure regime. Details will be refined as the week progresses. Hopefully you all can get up and enjoy the new snow this week!